Hello again and Welcome Back! 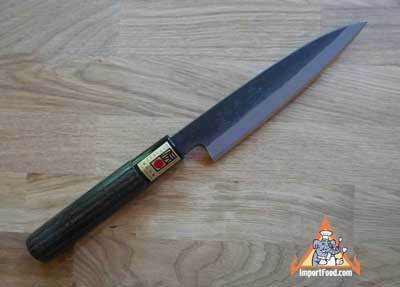 Today we feature Mae Krob crispy Thai noodle recipe, one of our hand forged knives from Japan is on sale, Orange Label black soy is back in stock, double quantity fresh kaffir lime leaves, and more. Thanks for visiting! Called 'Office Knife' in Japan. Highly useful, sharpened on both sides. Made entirely by hand at a master craftsman's shop in Sakai with American chestnut handle. Reg Price $130. We offer newsletter readers $90 while supplies last. Dark soy (in Thai, siu-dahm) is opaque, black, and viscous. The most prominent characteristic is the dark color and the taste of palm sugar molasses. A treasured formula, orange label is back in stock. Offered this last week and repeating the popular offer. Will ship immediately for arrival in two days. Every year in late September we have plenty of highest quality, large kaffir lime leaves, so for newsletter readers if you order our 40 leaf standard pack we will ship the 80 leaf large pack for the same $14.95 price.